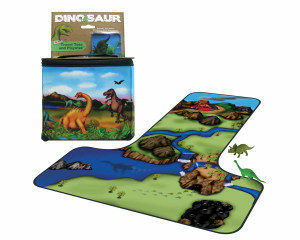 The ZipBin®20 Dinosaur Tote with Dinosaur has beautiful artwork featuring prehistoric creatures. With softs sides and a handle on top, the tote is convenient to carry anywhere. 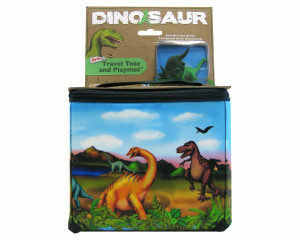 It is ideal for exploring like an archeologist and for storing your favorite collection of dinosaurs. 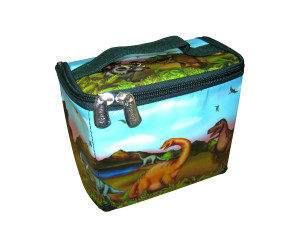 It also holds your lunch or school supplies and is great for field trips or camp. When unzipped it becomes a play mat or placemat that can be wiped clean with a damp cloth. Weighs less than one pound. Includes dinosaur. Have fun and decorate your room with all Neat-Oh!® ZipBin® Dinosaur products.